Outstanding imagery and character description. Readable, interesting, and almost cautionary in its description of what we have lost in today’s world of medicine. 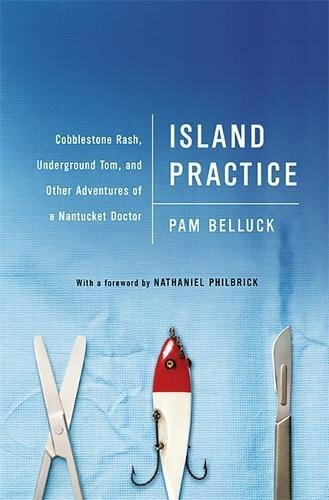 Thank goodness for writers like Pam Belluck who, in Island Practice, presents Dr. Tim Lepore, a cross between Marcus Welby and Hawkeye Pierce of M*A*S*H fame. He is a 30-year resident of Nantucket who raised his family and assorted “strays” there; in addition, he became the general surgeon, head of medicine, and medical examiner (throw in veterinarian to wounded animals and farm horses), and a nationally recognized expert in tick diseases. Dr. Lepore treats the ills of Nantucket hiding just below the patina of an idyllic island retreat for the well healed. Ten thousand residents who earn low pay for service jobs live there year-round. It is hard to get on and off island, but the “metaphorical distance” is even more considerable—yielding either a feeling of vulnerability or invisibility. There is a constant undercurrent of drug use, suicides, criminal cases, murder victims, alcohol abuse, and even a hermit who constructs hideouts. “An outlier and a maverick” in today’s health care system, Dr. Lepore is a Harvard Graduate, Class of 1966. This man is controversial, given to brash assertions, and sees no point in filtering exactly what is on his mind. If fog enshrouds the island, he is forced into taking risks that would be unheard of elsewhere, but does not hesitate to evacuate (in good weather) if he feels the patient has a better chance at a place like Mass General. Dr. Lepore is “not just a sawbones to the summer rich.” He ministers to a variety of illnesses endemic to an island population. On any given day, he might deal with issues ranging from Cobblestone rash (abrasions sustained by slips and falls on Nantucket’s uneven pavement, especially by inebriated residents), to narcolepsy or rare tick diseases. He is often paid in kind, with an inconsistent income and a huge overhead. His office is “kind of icky and dirty,” being filled with stuffed animals and posters. He treats patients in his hunting clothes, even to celebrities and the likes of the Kerry and Kennedy families. He actually commissioned a baker to make marijuana cookies for patients suffering from cancer. This idyllic island is home to an ever-burgeoning population of deer. Lyme Disease, Bbabeosis, and Anaplasmosis are endemic in the human population. Dr. Lepore is a tick crusader and is consulted by physicians everywhere. Hunters drop off their bounty for him to siphon ticks for further study. Island residents are strained by tick bites (2,500 bites yielded 250 diseases one year, then 411 the next). Yet the tug-of-war between public health officials who wish to cull the herd of deer and the outcry of the residents (many of whom are pro-choice when it comes to human reproduction) is neverending. Wife Cathy Lepore is a saint—a nurse and school counselor, who took in her share of relatives and foster children over the years. She understands and supports her husband’s driven personality. All three children were constantly challenged, but loved and respected him. Two followed in his footsteps yielding a physician and a nurse practitioner. He experienced heartbreak with his youngest, Nick, who later straightened up and became a lawyer. In the maelstrom known as today’s healthcare, not only is Dr. Lepore a vanishing breed, but the system works to rush his extinction. A 19-bed hospital cannot provide the cutting edge care necessary or available elsewhere. Like many healthcare institutions, the hospital struggles to make itself more cost effective. Island Practice is a work of evocative imagery and human description. It is readable, captivating, and almost cautionary in its description of what we have lost in today’s world of medicine. Author Pam Belluck has integrated medical, personal, and family issues into a fascinating portrait of a remarkable man. In her acknowledgments she states that the family had no desire to airbrush the facts and allowed an honest rendering of island life and the life that they created as residents. In sum, this is no hagiography. One question remains unanswered: What are people living in outlier locations going to do when people like Dr. Tim Lepore no longer exist? Diane Brandley is a newspaper columnist, magazine contributor, and book reviewer who also has an MS in Nursing and worked for 40 years in non-traditional roles in public health.